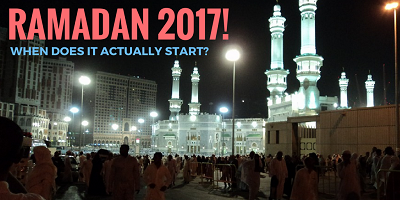 ﻿ Ramadan 2017 - When does it actually start? When does it actually start? Ramadan (pronounced "rom-a-don"; a.k.a. Ramazan) is the holiest period in the Islamic year. It extends over the ninth lunar month, which is also called Ramadan. It commemorates events during the year 610 CE when Muslims believe that revelations began from God to the Prophet Muhammad, via the angel Gabriel. These revelations were memorized by Muhammad and were later written down as the Qur'an. There is currently no consensus among Muslims around the world about the precise method by which the first day of Ramadan is to be determined. Ramadan begins at the time of the new moon -- a.k.a. the time of conjunction of the Earth, Moon, and Sun, when they are lined up in that order. Easily visible to the naked eye throughout the main population centers in Canada, and everywhere in the United States including the Aleutian Islands of Alaska, Central America, South America, and sub-Saharan Africa. Visible, if viewing conditions were perfect, in the rest of Alaska, Northern Canada, Spain, much of the Mediterranean, and Northern Africa. Easily visible with a small telescope in Canada's far north, Southern France, Italy, Greece, Turkey, India, Indonesia, and Western Australia. Visible with a small telescope under perfect viewing conditions in Southern Ireland, Southern England, Northern France, Northern India and Eastern Australia. An increasing number of countries are now using astronomical calculations to determine the actual timing of the new moon independent of human eyesight. These calculations can be peformed months or years in advance so that the date of the start of Ramadan can be scheduled like other seasonal day of observance or celebration. AUG-31 in Libya and Nigeria. SEP-01 in 52 countries, including Australia, Mexico, Saudi Arabia, UK, and the USA. SEP-02 in 8 countries, including India, Iran, Morocco, Oman and Pakistan. Sighting the Hilai (the crescent moon) is not an act of 'ibadah (worship). Muhammad used ru'yah (sighting of the crescent moon) because most Muslims at the time lacked the knowledge to calculate the timing of the new moon. Some Muslim jurists at the time refused to accept astronomical calculations because "astronomy and astrology were not quite distinct sciences" at the time. They suspected that the predictions might have been based partly on magic and conjectures. During the 20th century, an increasing number of Muslim jurists have accepted the astronomical calculation. This is a reliable and accurate method of determining the dates of the start of Ramadan and of the end of the month at Eid, as well as the start and ending of the remaining 11 lunar months in the Muslim year. Eliminate the problem of erroneous sightings of the crescent moon. Improve the unity of Muslims worldwide. The Fiqh Council decided that "The new Islamic Lunar month begins at sunset of the day when the conjunction occurs before 12:00 Noon GMT." 2 This definition includes all 12 lunar months in the year. "Council President Mohammad Moussaoui said the old method played havoc with French Muslims' schedules for work, school and festivities. France's five million Muslims are the largest Islamic minority in Europe. "Now all this will be simplified," he said, and promptly announced the Ramadan fast would begin on July 9 this year. ..."
During 2017 in Saudi Arabia, the Institute of Astronomical & Geophysical Research of the King Abdulaziz City for Science and Technology (KACST), used astronomical calculations to set Ramadan as beginning in the year 1438 AH on 2017-MAY-27 and ending on JUN-25. The same calculation is used by the Islamic Society of North America (ISNA), the Fiqh Council of North America (FCNA), the European Council for Fatwa and Research (ECFR), in Turkey, and in various Muslim communities in the U.S., Europe, Australia, etc. However, religious leaders in Saudi Arabia still waited until the first sighting of the lunar crescent after the new moon. 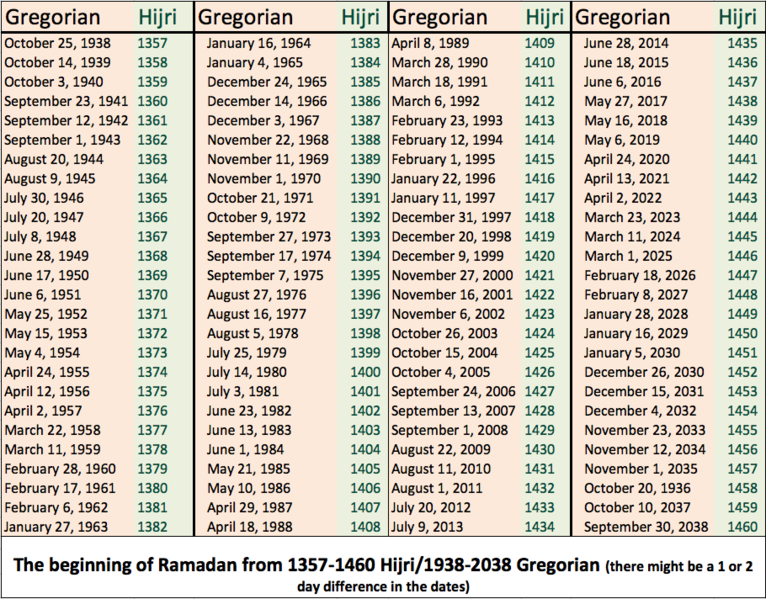 They determined that Ramadan would began on the same date -- MAY-27, as the astronomical calculations had predicted. Ramadan has traditionally started at the first visual sighting of the 9th crescent moon of the year by the unaided eye. It lasts for 29 or 30 days, a full lunar month. Lailat ul-Qadr (a.k.a. Night of Power) is the anniversary of the night on which the Prophet Muhammad first began receiving revelations from God. Muslims believe that this occurred on one of the last odd-numbered nights of Ramadan. EId al-Fitr (a.k.a. "EId") is the day which follows the month of Ramadan. It is pronounced "eed-al-fitter." It is the first day of the 10th month -- Shawwai. It is a time of rejoicing. Houses are decorated. Muslims buy gifts for relatives. On this feast day, Muslims greet each other, saying "Eid mubarak" (eed-moo-bar-ak), meaning "blessed Eid," and "taqabbalallah ta'atakum," which means "may God accept your deeds." Many Muslim communities hold bazaars following prayers. The abbreviation "H" or "AH" is used after dates in the Islamic calendar. They stand for "Hegira" or "Anno Hejira". The base of the Islamic calendar is 622 CE, the year of the Hegira, when the Prophet Muhammad traveled from Mecca to Medina in what is now Saudi Arabia. Approximately every 35 years, Ramadan occurs in the summertime over an interval of about ten successive years in the Northern Hemisphere. This can make fasting from liquids more challenging from sunrise to sunset because of the heat. It also provides a special challenge to Muslims living in the far North, above the Arctic circle, where the sun does not set during part of the summer. The last time that Ramadan occurred in Summer was in the 1980's, when relatively few Muslims lived there. However, many Muslims have left the Middle East since then and have settled in Sweden, Norway, Finland, etc. "... the sun doesn't set. For 24 hours it's in the middle of the sky. We have a fatwa [a clerical decree]. We can correspond the fast to the [schedule used by the] closest Islamic country, or we can fast [in synchronism] with Mecca." Muslims in Tromsø, now observe Ramadan according to the timetable used in Mecca. If the sun rises in Mecca at 5 AM, at their local time, Muslims in Tromsø being their fast at 5 AM Tromsø time. The fast of Ramadan Overview, purposes, discipline, health concerns, activities, etc. Chart was provided by a visitor to our web site. Its origin is unknown.